Miguel, J., Caballé, S., Xhafa, F. (2016). 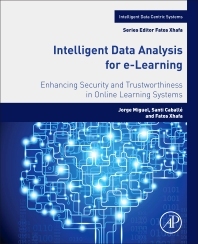 Intelligent Data Analysis for e-Learning: Enhancing Security and Trustworthiness in Online Learning Systems. Book Series “Intelligent Data-Centric Systems”. 192 pp. Amsterdam, Netherlands: Elsevier. ISBN: 978-0-1280-453-50. The book addresses information security within e-Learning based on trustworthiness assessment and prediction. Over the past decade, many learning management systems have appeared in the education market. Security in these systems is essential for protecting against unfair and dishonest conduct—most notably cheating—however, e-Learning services are often designed and implemented without considering security requirements. This book provides functional approaches of trustworthiness analysis, modeling, assessment, and prediction for stronger security and support in online learning, highlighting the security deficiencies found in most online collaborative learning systems. The book explores trustworthiness methodologies based on collective intelligence than can overcome these deficiencies. It examines trustworthiness analysis that utilizes the large amounts of data-learning activities generate. In addition, as processing this data is costly, the book offers a parallel processing paradigm that can support learning activities in real-time. Finally, the book discusses data visualization methods for managing e-Learning, providing the tools needed to analyze the data collected. Using a case-based approach, the book concludes with models and methodologies for evaluating and validating security in e-Learning systems.